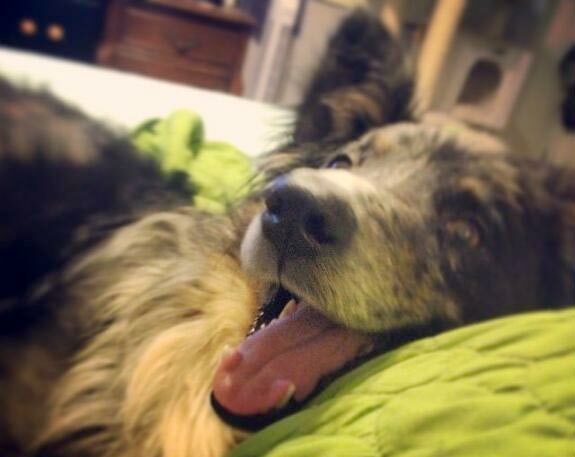 The Tripawds Foundation is pleased to announce ASAP veterinary financial aid grant recipient #2! 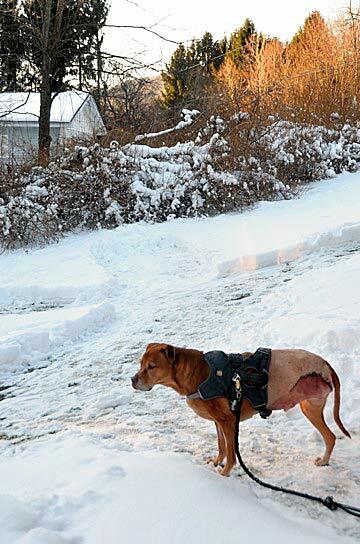 Read on for Theo’s story, and learn more about the Tripawds Amputation Surgery Assistance Program. Theo has been my constant companion and a neighborhood favorite since I adopted him at six weeks. 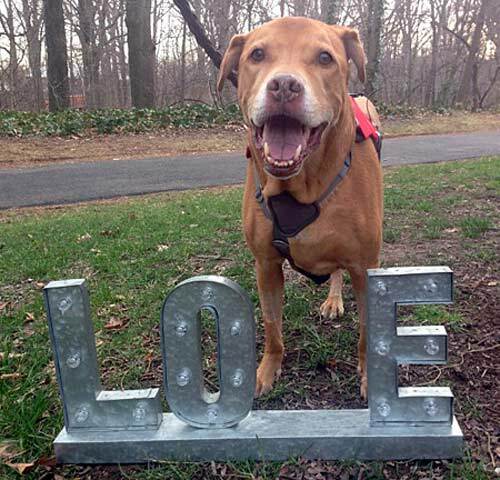 He was a tenacious and loving puppy and grew into a remarkable dog who has been an canine ambassador, a rescuer of abandoned creatures and a comfort to others his entire life. A couple of years ago I noticed he developed several lumps on his skin, lipomas that usually come with age in most breeds. These are benign and usually stay a certain size. Unfortunately one of the lumps began to grow so slowly I did not notice it until neighbors brought it to my attention. I had a couple of biopsies but there were inconclusive. Then recently it became so large that it was suspected that it might be cancer. It did not cause him pain or impair his gait yet it stretched the skin like a balloon and began taking up more and more real estate on his back leg. The only way to be sure about this growth I was told by vets was to surgically remove the entire mass and have it biopsied. 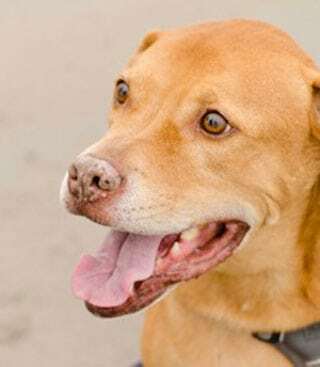 But surgeons and vets could not agree about the best method to do this because there was no diagnosis and the margins of the tumor were unknown. It became clear after several consultations that one of the options, amputation of the leg would offer the best hope of both an accurate diagnosis but most importantly would almost guarantee the mass would not return, especially if was an aggressive cancer. 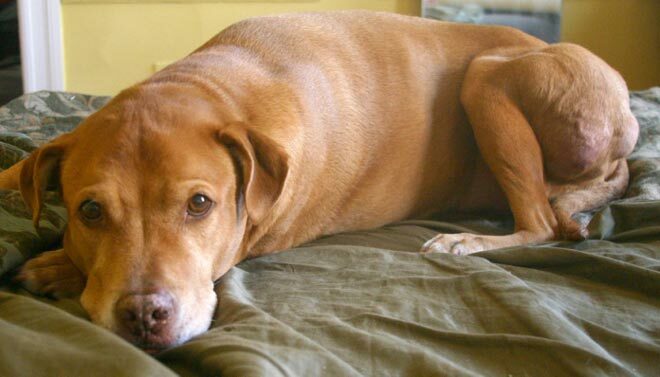 With such an active dog, who at 10 years old walked with me everywhere in Brooklyn and could out run dogs years his junior, it was a difficult to imagine a complete amputation of his entire leg and what his life would be like. Then there was the cost. To accurately assess the depth and margins of the mass would require a full body cat scan along with surgery. As an animal advocate and artist I had used my talents to raise money for animals causes from canine cancer to rescue to therapy dogs throughout the years so was aware of the expense, especially in NYC. Theo and I had been through many recent challenges that prevented me from affording this and he was no longer eligible for any insurance. He had also been turned down for all financing or grants that I knew of locally. 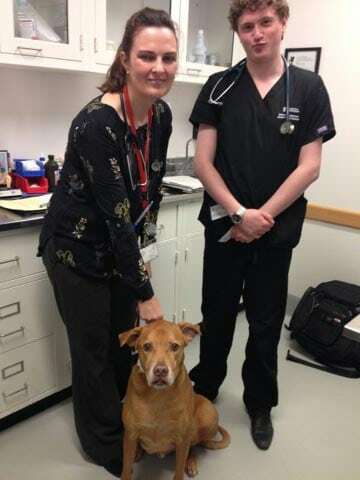 Then I found out about Cornell University Hospital for Animals in Ithaca, a five hour trip from my home in Brooklyn. Wendy, the Client Services Manager was amazing from the start and ended up not only offering me a generous grant but a list to others as well. We applied and received several more and were introduced to Tripawds who were not only wonderful with their advice but offered us a grant as well. I contacted the SPCA in the area and a lovely couple generously offered us a place to stay, transportation in the area, emotional support and even meals for two weeks. A good friend also named Theo volunteered to take us to Ithaca and back driving both directions round trip so with that and the help of a few other friends we were on our way. He did exceptionally well, and was walking and just about running in two days. Everyone was amazed and he was discharged a day early. The surgeon, medical student assistant and staff were terrific and Theo loved the hospital despite what he had to leave behind. It’s been less than 2 weeks since his surgery and he is still doing incredibly well. He is back in Brooklyn exploring the neighborhood, visiting his favorite retail spots for treats and love and visiting friends. Today he had his stitches taken out and we got the wonderful news that his leg biopsy showed that the surgeon was able to get good margins and he is essentially cancer free. Oh my goodness!! I’m head over heels in @ove with THEO!!! Soooo glad this very special Aoul received help fro TRIPAWDS and from soooo many others! He, and yiu, are soooo deserving!!! I keep scrolling back up to look at his precious pictures! Theo is so handsome!! Theo and the LOVE sign….ADORABLE!!! Thanknyiu so much for sharing your delightful Theo with us. We look forward to following his journey AND more lictures!